Every desk needs one of our desk buddies! A dog-shaped buddy filled with sand gives them a decent weight to be used as a paper weight or pin cushion. They are handmade to order by our wonderful UK designer Annette's Allsorts and available in a wide choice of different fabrics. 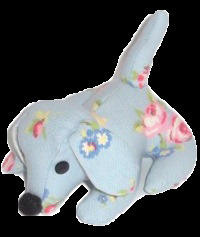 Our beautiful dog shaped desk buddies are perfect to be used as paper weights, pin cushions or even just an ornament. Each one has been filled with sand to give them a good weight, they are extremely handy in any office or work room. Choose from a wide range of fabrics including some doggy ones and we’ll have your desk buddy handmade to your specifications by our lovely suppliers here in the UK and delivered straight to your door.